Nasopharyngeal carcinoma (NPC) is an epithelial tumour with a distinctive racial and geographical distribution. High incidence of NPC has been reported from China, Southeast Asia, and northeast (NE) region of India. The immune mechanism plays incredibly role in pathogenesis of NPC. 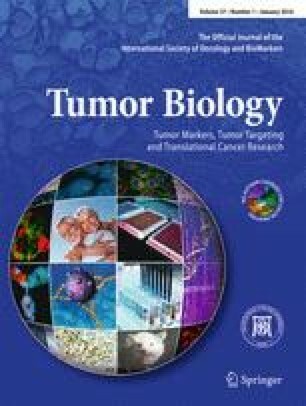 Tumour necrosis factors (TNFs) and heat shock protein 70 (HSP 70) constitute significant components of innate as well as adaptive host immunity. Multi-analytical approaches including logistic regression (LR), classification and regression tree (CART) and multifactor dimensionality reduction (MDR) were applied in 120 NPC cases and 100 controls to explore high order interactions among TNF-α (−308 G>A), TNF β (+252 A>G), HSP 70-1 (+190 G>C), HSP 70-hom (+2437 T>C) genes and environmental risk factors. TNF β was identified as the primary etiological factor by all three analytical approaches. Individual analysis of results showed protective effect of TNF β GG genotype (adjusted odds ratio (OR2) = 0.27, 95 % CI = 0.125–0.611, P = 0.001), HSP 70 (+2437) CC genotype (OR2 = 0.17, 95 % CI = 0.0430.69, P = 0.013), while AG genotype of TNF β was found significantly associated with risk of NPC (OR2 = 1.97, 95 % CI = 1.019–3.83, P = 0.04). Analysis of environmental factors demonstrated association of alcohol consumption, living in mud houses and use of firewood for cooking as major risk factors for NPC. Individual haplotype association analysis showed significant risk associated with GTGA haplotype (OR = 68.61, 95 % CI = 2.47–190.37, P = 0.013) while a protective effect with CCAA and GCGA haplotypes (OR = 0.19, 95 % CI = 0.05–0.75, P = 0.019; OR = 0.01 95 % CI = 0.05–0.30, P = 0.007). The multi-analytical approaches applied in this study helped in identification of distinct gene-gene and gene-environment interactions significant in risk assessment of NPC. This work was supported by Department of Biotechnology (Sanction Order No. & Date: BT/PR11126/Med/30/131/2008/03/2010). One of the authors (Meena Lakhanpal) thank the University Grants Commission, India (Ref. No: 20–1212009 (ai) EU-lV), for providing research fellowship.